In other results on Saturday, Nigeria were emphatic 3-0 winners in their game at Seychelles and next year's Nations Cup hosts Cameroon were held to a 1-1 draw away to Comoros. The Harambee Stars scored the only goal of the game after 40 minutes when Ghana's Nicholas Opoku struck into his own net. Ghana pressed for an equaliser and the pressure told as Kenya's Joash Onyango was sent off shortly after the hour mark. 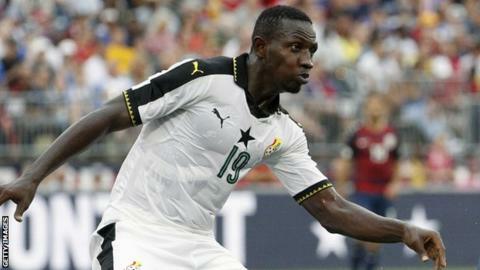 Stephane Bahoken spared Cameroon's blushes with an equaliser 10 minutes from time. Morocco - who lost to Cameroon in their opening Group B qualifier - defeated Malawi 3-0 in the late match on Saturday. Hakim Ziyech opened the scoring for Morocco in the third minute, with Youssef En-Nesyri scoring two more to seal the win for Morocco who now level with Malawi on three points - a point behind group leaders Cameroon. Comoros are bottom. Points won by Cameroon's opponents in qualifying count towards their final totals in the group. In Group E, Nigeria's Ahmed Musa picked up where he left off at Russia 2018 by scoring the Super Eagles' opener after 15 minutes in their 3-0 victory away to Seychelles. Gernot Rohr's men needed a victory to get their bid for next year's Nations Cup back on track following Nigeria's opening 2-0 home defeat by South Africa in June 2017. Justin Shonga's late strike cancelled out Benson Shilongo's opener to give both teams their first points of Group K.
Egypt featured later on Saturday in Group J, with Liverpool's Mohamed Salah on target for the Pharaohs in their 6-0 win over Niger. The Group D fixture between The Gambia and Algeria was delayed due to over-crowding in Bakau where Baghdad Bounedjah put Algeria ahead just after the break. Assan Ceesay equalised for the hosts two minutes later as The Gambia grabbed their first point of the campaign in a 1-1 draw. Senegal, Ivory Coast and DR Congo are among the teams scheduled to play on Sunday.